Studies began of the E early on in 1937. 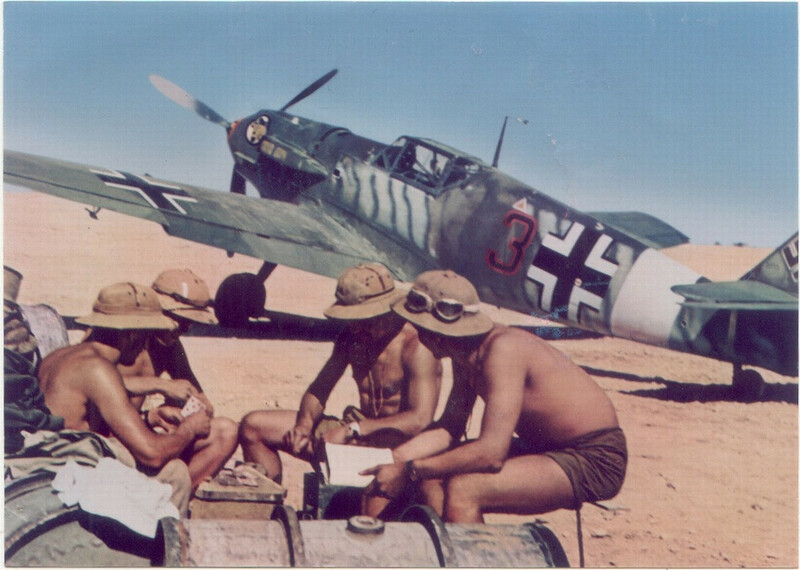 Meanwhile a total of 647 Bf 109Ds (Dora) of all sub-versions were turned by Focke-Wulf, Erla, Fieseler, Arado and AGO. Almost none were manufactured by Messerschmitt, but licenced instead, leaving the master company free to concentrate on the Emil. At that time the only engine available was the 441–515 kW (600–700 PS) Jumo 210. 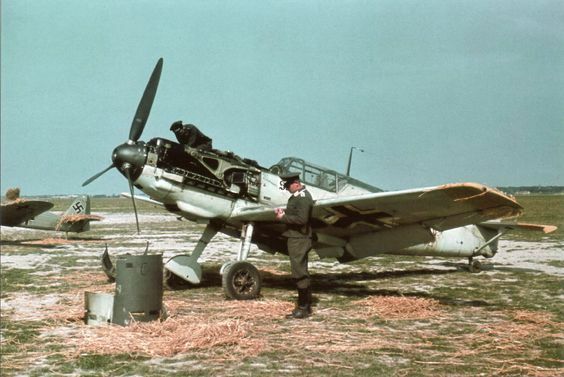 It was reliable, but still lacked power to allow more payloads on the Me 109 cell. In fact, the Daimler-Benz DB 601A engine was procured. This heavier and longer power unit (181 kg (400 lb) more) packed indeed an impressive extra 223 kW (300 PS). This forced to design a quite larger cooling area, and forced the adoption of a brand new airframe, riddled with massive air intakes. 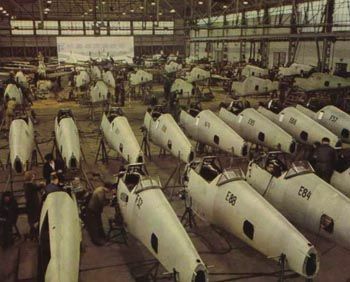 In all, about 3546 Messerschmitt me 109 E or "Emil" were built, and about 12 variants and sub-variants were made, with many retrofits of surviving planes in summer of 1940. The decision to modify the wings rather than simply enlarging the engine nose mounted radiator was dictated by considerations of drag and top speed only. These new radiators were placed in between the wing root and wing panels. This need to modify the trailing edges inner ends and confine the oil cooler under the nose inside a smaller streamlined duct. The counterbalancing effect of these radiator had another advantage, which was to allow the fitting of a larger three-bladed propeller made by Vereinigte Deutsche Metallwerke (VDM). The wings has been reinforced, integrating several inboard ribs and large radiator ducting. Another inducted effect was that the radiators ends met the trailing edge of the wing's camber. Therefore the airflow was faster and the overall cooling more efficient, although with the trade-off of additional, fragile extra ducting and piping. Also, when landing, the deployed undercarriage could deflect mud and debris right into the radiators. The serie was tried by the protoypes V14 and V15. Both flew proficiently with the 1,100 PS (1,085 hp, 809 kW) DB 601A engine to test all the new plane's flight perimeter. 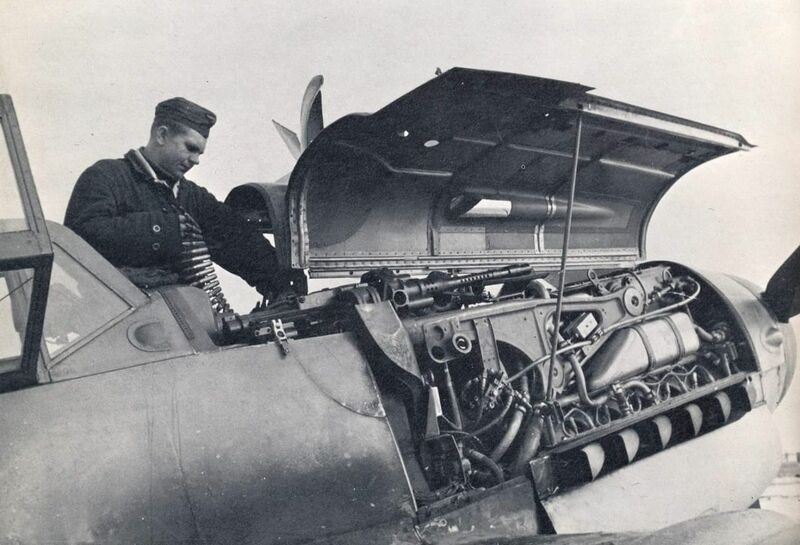 Both prototypes were armed with 1,100 PS (1,085 hp, 809 kW) DB 601A engine two 7.92 mm (.312 in) MG 17s above the engine but V14 in addition had two 20 mm MG FF in the wings. The latter proved the new airframe cell could well carry this weight, and it was adopted later for production by the RLM, that ordered first ten E-0 to be delivered in 1938 for further evaluations, with 4 × 7.92 mm/.312 in MG 17. Transitional production models, armed with two 7.92 mm (.312 in) MG 17s above the engine and two more in the wings. Many would be later modified to the E3 standard. In all, 1,183 E-1 would be delivered by Messerschmitt, and 110 E-1/B. The latter were the first fighter-bombers, later identified by the prefix "Bf" for Jagdbomber , or simply "Jabo". The belly and underwings were modified to carry either a central ETC 500 bomb rack (single 250 kg (550 lb) bomb) or four 50 kg (110 lb) bombs under the wings. In addition they received an improved Reflexvisier "Revi" gunsight and FuG 7 Funkgerät 7 short-range radio set. A few E-2 were cranked up, closely based on the V20 prototype. 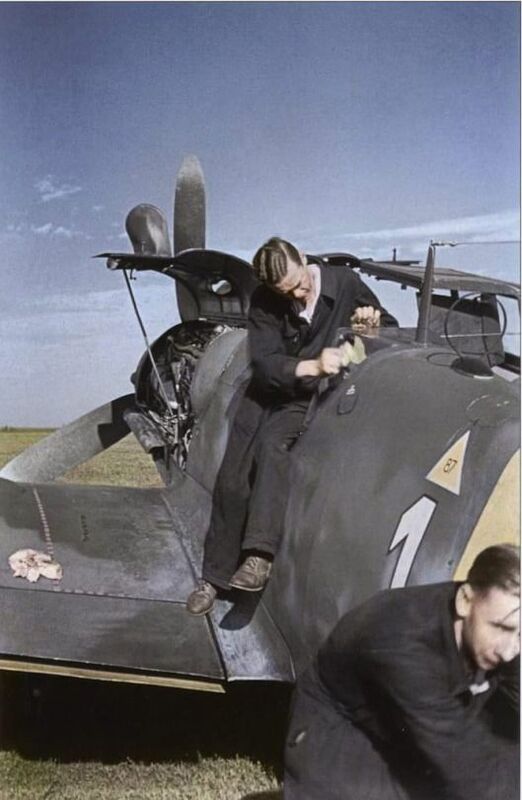 The Me109 E had one Motorkanone MG FF cannon in the nose and two in the wings. However the latter gave considerable trouble in service. The two synchronized MG 17s cowl machine guns also proved unreliable. The only E-2 produced were in service in August 1940 with the II./JG 27 squadron. The E-3 could be summed up as an upgrade in performance with two prototypes V16 and V17 constructed to tests structural improvements and a more powerful armament. 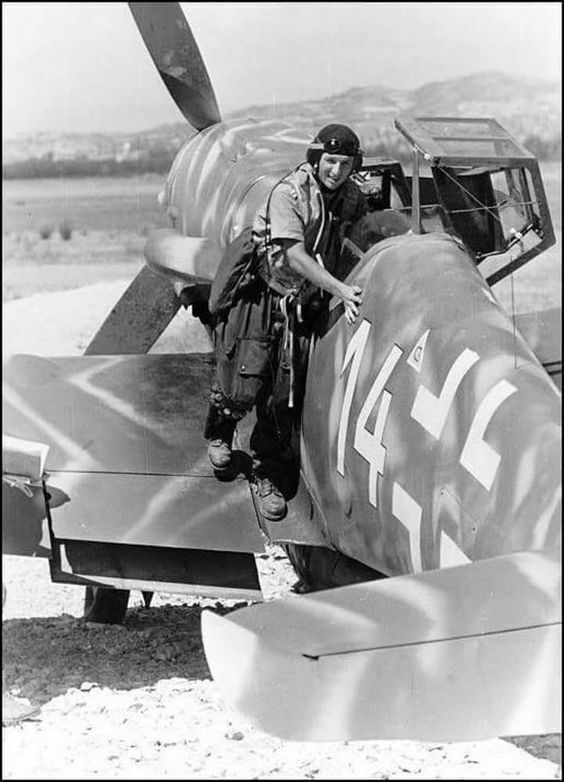 They served as a basis for the Bf 109 E-3, armed with the hood-mounted MG 17s above the engine, and a single MG FF cannon in each wing. Total production: 1,276 E-3 including 83 E-3a export versions, which made it the most common of all Emil types. The E-4 marked a new era, with many more E-3 airframes upgraded to this new standards at the start of the Battle of Britain in the summer of 1940. The Me 109 E-4 only differed in some details like the modified 20 mm MG-FF/M wing cannon, and improved neck armour above the pilot's seat. The MG FF/M could fire an improved explosive shell called Minengeschoß using drawn steel (like brass cartridges) rather than cast as usual. This resulted in a thin, light but strong cartridge able to store more explosive charge, enhancing muzzle velocity quite a bit. This shell imposed a revision of the MG FF's mechanism due to the recoil, hence the FF/M. The cockpit canopy was simplified for production, squared-off, also improving the pilot's vision. It was later retrofitted to E-1s and E-3s, and remained in production until the introduction of the welded heavy model of the new G type in mid to late 1942. Some E-4 would received an improved DB601N high-altitude engine rated at 1,175 PS (1,159 hp, 864 kW). This E-4/N was given to just one fighter gruppe from July 1940. Me109 E-4s were also abundantly used as fighter-bombers, under the designation of E-4/B. They were fitted with the DB 601Aa engine and E-4/BN engine. Total production: 561 (496 E-4s, 250 E-4, 211 E-4/B, 15 E-4/N, 20 E-4/BN). Both E-5 and E-6 were reconnaissance planes. A camera was installed behind the cockpit, and they were based respectively on the E-3 and E-4/N, with 29 E-5s and 9 E-6s ordered and delivered by Messerschmitt. 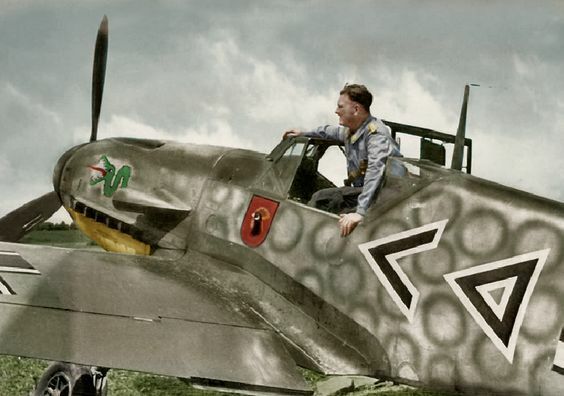 The Messerschmitt Bf 109 E-7 entered service and saw combat at the end of August 1940, and was marked by a net improvement in range: It was previously 660 km (410 mi) together with limited cruises performances. With the E-7 carrying a drop tank, standardized Luftwaffe 300 L (80 US gal) model mounted on a centre-line rack under the fuselage, it was now up to 1,325 km (820 mi). The same rack could also mount a bomb for Jabo fighter-bomber squadron operations. Retrofits of previous types were made with this belly fittings from October 1940. 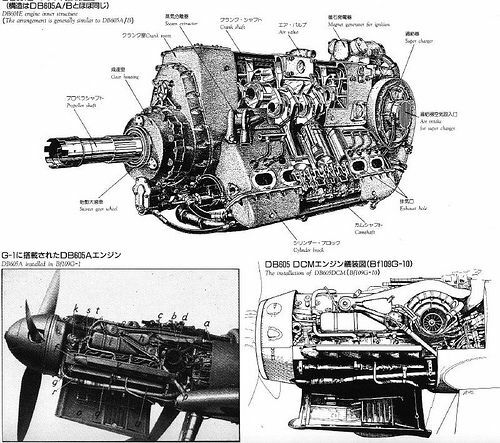 Standard engine was the 1,100 PS DB 601A or in alternative the 1,175 PS DB 601Aa engine. Late-production engines were 1,175 PS DB 601N with better in high altitude. This second serie was designated as E-7/N. The Me 109 Emil was introduced before the war started and made the bulk of the Luftwaffe at the eve of the summer of 1940. So this was the most common version of the Me 109 throughout the western campaign, duelling with Dutch, Belgian, French planes and the RAF, from May to September 1940 at the end of the air war over Britain (The battle of Britain), where its only true rival was the Spitfire, which unfortunately was armed with a rather light -if numerous- array of standard 3 inch machine-guns. Performances of both planes has been extensively detailed during the battle and abundantly debated ever since. The "Spit" was slightly slower in some areas, but also more agile, while the "brutish little hun" was not the fastest, but perhaps the deadliest when close enough to deliver the punch of its combined machine guns and cannon, better suite to very fast engagements rather than the British "spray and prey". It should be remembered however that statistically the main opponent of the me-109 (also credited with most victories) was the Hawker Hurricane. In raw engine power, the Merlin proved superior to the DB, with room to spare, still around 800 hp at 24,000 m while the Me 109 could climb higher but only developed 700 hp passed 25,000m. 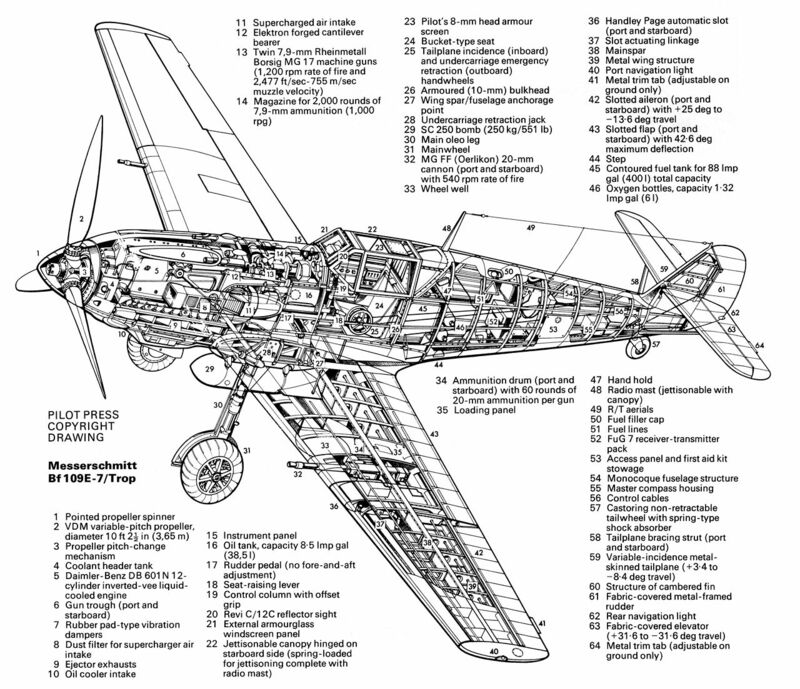 In terms if agility, the Me 109 roll rate proved superior, but was similar about 300 mph at 45°. According to Olivier Lefebvre (a noted authority on the Me 109), only a few E-4 received the DB601N (as E-4/N), considered quite troublesome. The bulk of the production and licences went to the DB601A.